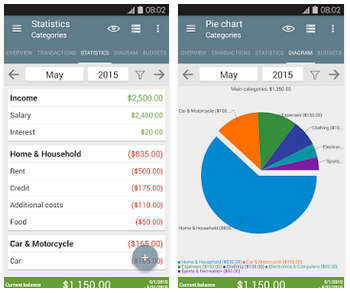 Let My Budget Book 6.9 help you manage your expense and income right on your Android! This app is full-featured, intuitive, and actually works. - Available offline. The app has for security reasons no internet permission. - Configurable Material Design layout. 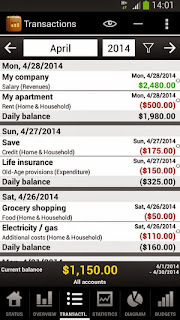 - Switch between the different views current balance and monthly balance. 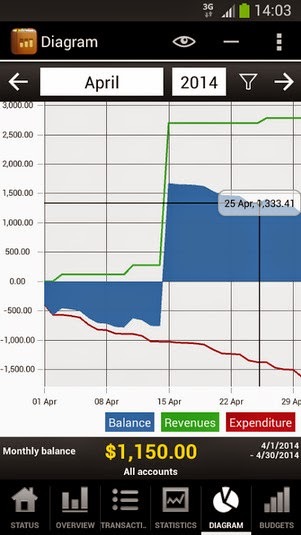 - Visualise the statistics as a table or graph and see where you have spent your money. - Manage multiple accounts and make transfers between them. - Add further main and subcategories to analyze your cost curve. - Add photos (e.g. receipts) to your transactions. - Use reminders to remind you of pending payments. - Define the beginning of the month based on your regular salary (e.g. the 1st or the 15th). - Reconcile your expenses with your bank statement. - Create templates to make the input of your transactions even easier. - Filter and sort your transactions according to various criteria and time periods. - Protect your sensitive data with a password. - Import existing data or bank statements using the CSV import (import of other formats on request). - Export your data to HTML or CSV in order to view or print them on your PC. - Create backups so you never lose your data (including automatic backups). - You can now view the sum of the budgets and you can select for every budget if it should be included in the sum of the budgets. The sum of the budgets can be activated in the general settings of the app. - You can now add a comment for each account. 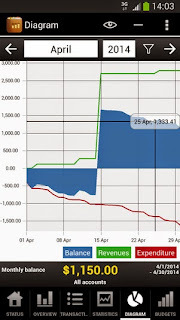 - Optimizations for Android 6. - All changes can be found in the "info" dialog.